Kaplan’s paintings are often infused with a spiritual dimension; here, the still life of fish, onions and vodka seems almost sacramental, irradiated as it is with the peculiarly luminescent use of tone and colour which is such a feature of his work. The arrangement floats against a suburban night-time background, in the way Chagall’s lovers float above his little towns; the only anchor here seems the collaged vodka label, which is seamlessly incorporated into the volume of the painted bottle, bequeathing a supranatural realism to the whole. 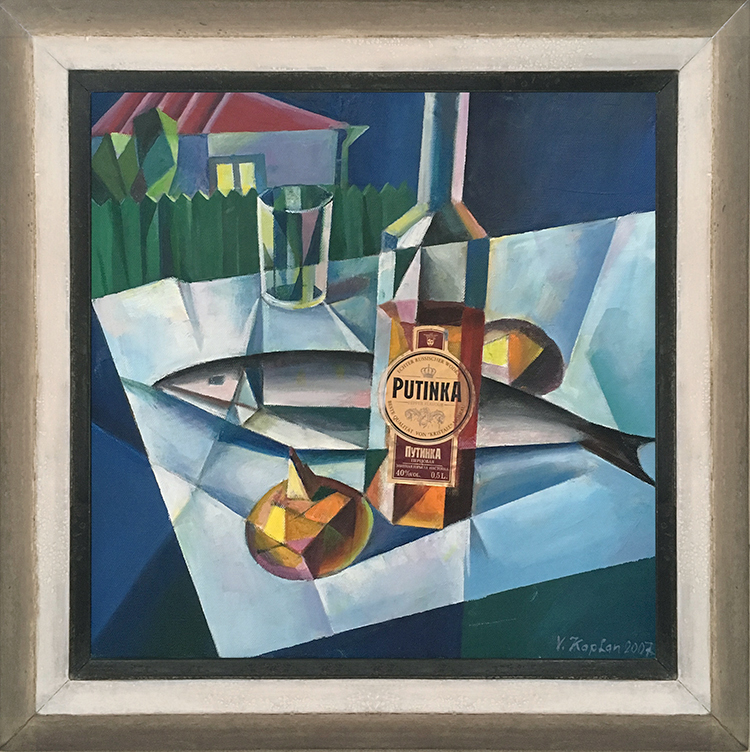 It is a nuanced version of his more allegorical pictures, and the cubism is subtly tailored to reflect this. As with Chagall’s designs, it is easy to imagine the clear, ringing colours of this painting reproduced in stained-glass. Viktor Kaplan was born in Krasnodar, Russia, near the eastern coast of the Black Sea. He trained first at the Krasnodar School of Art & Design, and then moved to Moscow, where he attended the State University of Printing Arts. Whilst he was still a student in Moscow in 1973, he met his idol Marc Chagall, and was able to show him his own work. His approach was inevitably influenced by this experience; it is visible in his use of colour, his romantic and sentimental tendencies, and the touch of magical realism which invests his compositions. A trace of Chagall’s designs for stained glass windows can also be discovered in Kaplan’s paintings. However, his preferred style is geometrical, classicizing and cubist. He was employed as a teacher at the art school where he had first studied, in his home town of Krasnodar, and later became head of the design faculty; he has also worked as a theatrical designer. Since 2001 he has worked as a freelance artist; he has shown his work in various exhibitions in Germany.